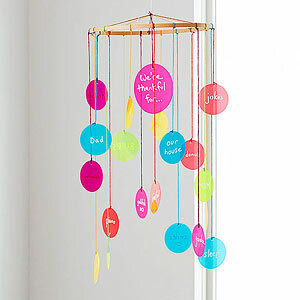 whirled tree arts creativity blog | Let our inspiration be your inspiration! Join us here for resources on art therapy, art activities, inspirational quotes, videos, stories and photos from the arts community. 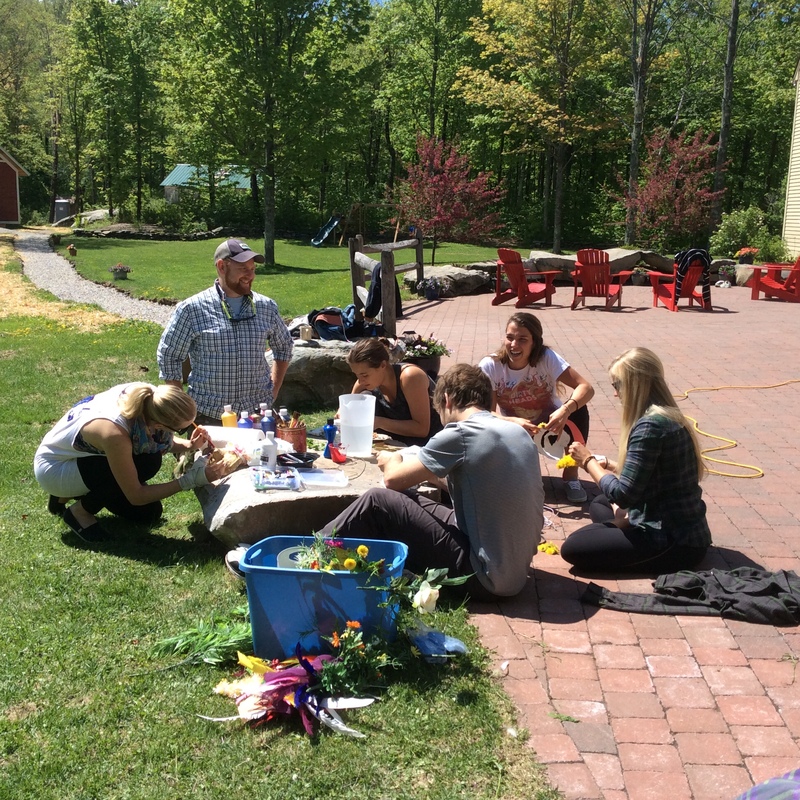 This past May, Whirled Tree Arts had the honor of leading an art therapy project for the LoveYourBrain Foundation’s annual retreat for people affected by traumatic brain injury (TBI). The story that follows is that of TJ Johnson, an artist, loving wife, beautiful person and survivor who attended the retreat for the first time after a horrific accident that injured her brain. This is a story of overcoming all odds, finding the light in life’s darkest shadows and how making art with others can change lives. Life can be full of surprises, some beautiful and some disguised as mountains for us to climb. My name is TJ and this is my story of overcoming the odds. I am one of those people that typically tries to find the silver lining in all things. I am an artist who loves life and the outdoors and has always enjoyed meeting new people and inspiring others through my work. On April 20, 2014 everything about my life that I knew changed drastically. I had just arrived in Charlotte, NC from Calgary, AB with my wife and was feeling happy to be on vacation. I was going to introduce my wife to my friends and reconnect with people I hadn’t seen in over eight months. My best friend had just met us to help us move furniture with her pick-up truck and, in my excitement of seeing her, I jumped on the back of the truck’s bumper. She hit the gas not realizing I was not holding on tightly and I flew off and hit my head on the pavement. According to my wife you could hear my head crack over the sound of the truck engine. In the ICU, it was not looking likely that I would survive. I had suffered a Basilar skull fracture- the hardest part of the skull to break or crack. I had also broken my left temporal bone and had bruised the entire frontal lobe of my brain. Luckily with a lot of prayer, I somehow did the impossible and survived. The road to recovery has been a long one and one that will never really end. Fresh out of the hospital I could barely function and had little sense of my surroundings or of who I was. As the months went by and my brain began to heal, the people around me saw I had changed. I could not allow my brain to be over stimulated, no computer, TV or loud groups for more than fifteen minutes a day. The social person everyone had known was now gone. In her place was a person that needed sleep, quiet and could only take things in little doses. My exhaustion was quick and I could only do what my brain would allow. It was hard for people in my life to understand that these changes in my behavior and activities were not voluntarily especially as time passed and my injuries were no longer outwardly visible. It seemed hard for others to know that inside there was still so much healing to do and that the changes in my personality and interests were the effects of my disabilities. This is who I had become in order to heal my brain and survive. Art has always been my healing. It has been a way to express myself and the things inside me that words just cannot say. Happiness, joy, sadness, struggle, love, life, all of it can be expressed with just one stroke of the brush and paint. Before the accident, I had been able to see my paintings in my brain before I did them. After my injury all I saw was blankness, which worried me. What if I could not paint anymore? What if art was no longer possible for me? Before the accident, I was starting to become a successful artist getting paid commissions, showing work at art shows and having pieces up at various businesses and homes. People were inspired by my work. It moved them and that was the greatest reward of all. Just to help people feel something, had helped me feel as though I was contributing to life. After the injury, I had asked, now what? What do I have to contribute now? Perhaps I needed to make peace with the fact that I was broken and that art was no longer a part of my life. With this, sadness set in. 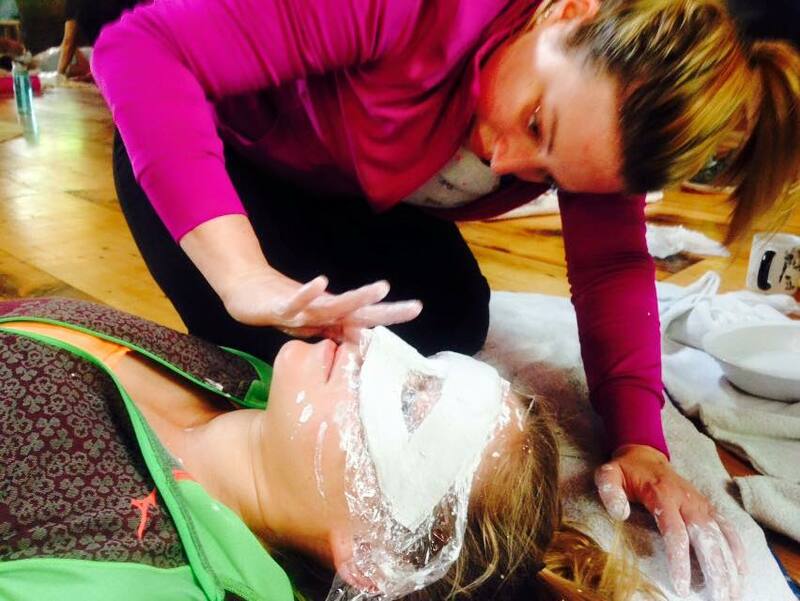 Then I attended the LoveYourBrain Camp at Zeno Mountain Farm in Vermont. I was excited and nervous. It had only been about a year since my injury and I had a lot of healing left to do, both physically and emotionally. Through my recovery process I had become more introverted, and felt very alone and misunderstood. Being with a new group of people worried me. What if I could not relate? This had seem to be my experience in the world since my injury: I couldn’t relate to people anymore, let alone inspire them. I can now say that LoveYourBrain Camp was one of the most life changing experiences I have ever had. One particular element of the retreat that significantly affected my healing process, was an art therapy project led by the amazing Carolyn with Whirled Tree Arts. Using plaster and decorative materials, Carolyn had us make masks to express the metaphorical masks we wear related to our injuries. Although it may sound strange, throughout my recovery I hadn’t thought about doing art to express my injury. Even though I am an artist, it had never occurred to me to use art to explore my experience of injury and recovery. The mask project however opened something up in me I didn’t even know needed to be opened. The first day of the project we made the masks on our own face using plaster strips with a partner. I worked with a man named Rey who is truly a ray of light. The process of making the masks on eachother’s faces helped Rey and I bond in such a vulnerable way. I did Rey’s mask first, putting the Vaseline on his face so the plaster wouldn’t stick to him. We laughed and giggled as the mask hardened because we had to stop talking which was not easy for Rey!! Next it was my turn and Rey was so nervous he would screw it up since his right hand had been paralyzed from his injury. I hugged Rey and told him you cannot mess it up. It will be exactly as it should be. We both smiled and realized in that moment how this process of making the masks was a metaphor for our injuries. We came to see that, just because we cannot do things the way we used to does not mean we can’t do things beautifully. It made us both teary and something cracked in me. Rey asked for help and did an amazing job on my mask. Just getting to spend this time with him and being able to see everyone’s masks that day was just so much fun and beautiful. We were all so encouraging and supportive to each other. The next day we got to decorate our masks! 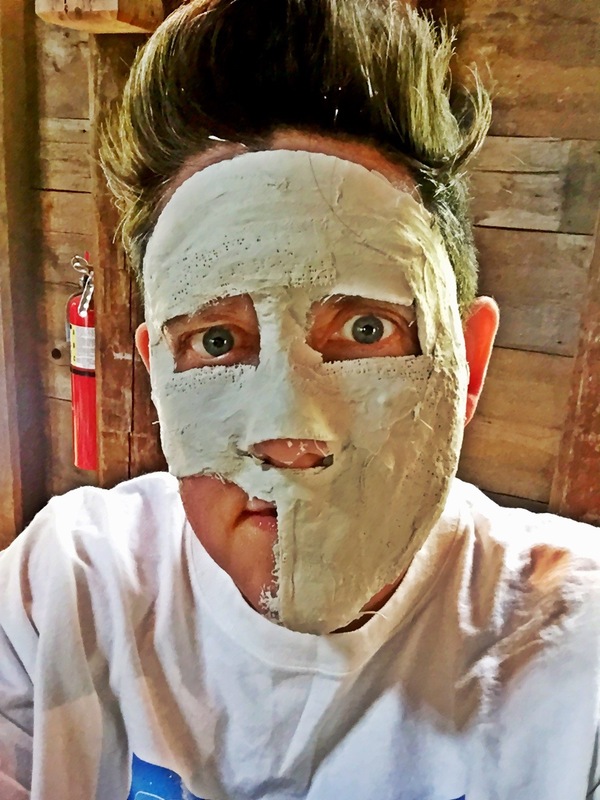 There were all kinds of things to choose from to help our masks come to life and express whatever it was we wanted. As I sat staring at my blank mask, emotion and creativity flowed. I felt a part of me come back to life; a part I thought was gone. There was an energy in the group of hope, love, and pure understanding as we watched our masks come to life. Being part of the creative process as a group was like being home with your dearest family members. It was beautiful. 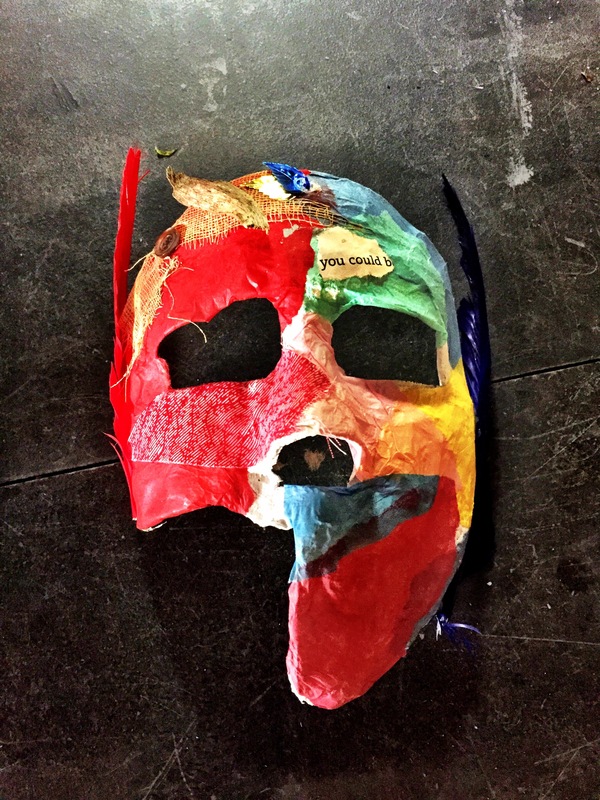 My mask has a piece of it missing, and it is made up of multi-colored papers so thin yet so bright. My head is stitched and held together and feathers are on the side of it. The piece missing represents the parts of me I don’t yet know but am learning about. The papers are how I feel after my injury. I am still this bright, loving, shining person who is broken and put together in parts but still whole. The feathers are my wings, and what everyone at the camp helped me to realize that despite my injuries I can still fly. 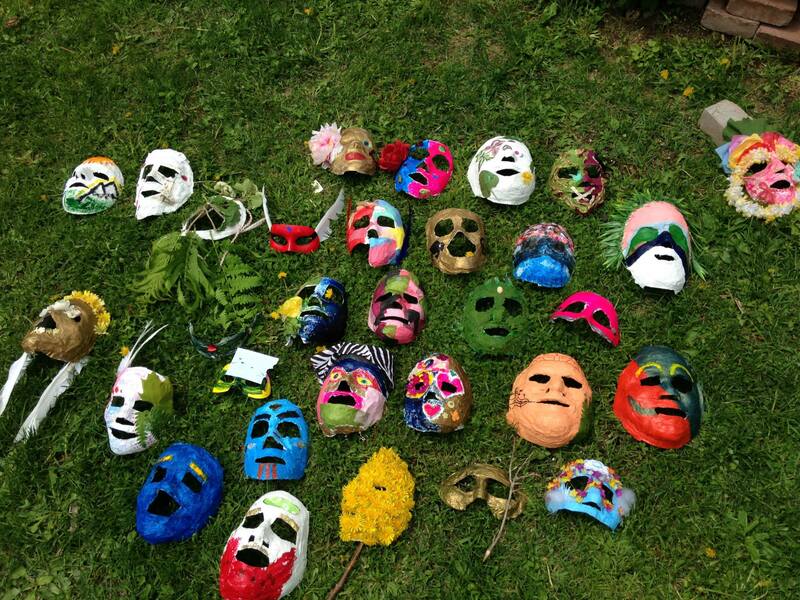 Part of the experience of the mask project was to share with one another what our masks meant to each of us. The process of sharing and reflecting as a group brings tears to my eyes even as I write this; tears of happiness, and love and of some sadness of my own. Before that day, I had never expressed how my brain injury made me feel. That process, and the opportunity to hear the stories of others in the group was nothing short of inspiring and life changing. It brought our group closer in a way that hadn’t seem possible by allowing us all to be so vulnerable and open in our sharing of love and understanding. The experience changed the course of my healing process in ways I can’t begin to describe. Even today, anytime I feel down or depressed I think of that circle and the stories that inspired me to rise above the hardships. We were a group of people who needed that sense of acceptance, understanding and love more than anything. 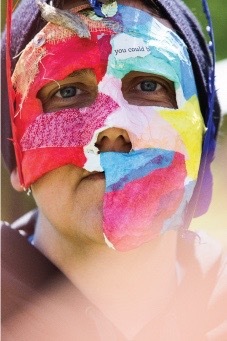 When you have a brain injury you just want to be seen and loved for exactly who you are and this mask project did just that for us. The project was not only fun but also therapeutic in ways I could never have imagined. As an artist, it helped me find my creativity again. I hadn’t realized that I had been suppressing my feelings about my injury. I wanted to be that person that everyone wants to be around but the truth is I don’t know who that person is anymore. I just know who I am now and once I was able to express how I was feeling the gates inside me opened up. My mask allowed me to realize that it is okay to feel and deal with my feelings about my injury. This was the key I needed in order to open the door to real healing. 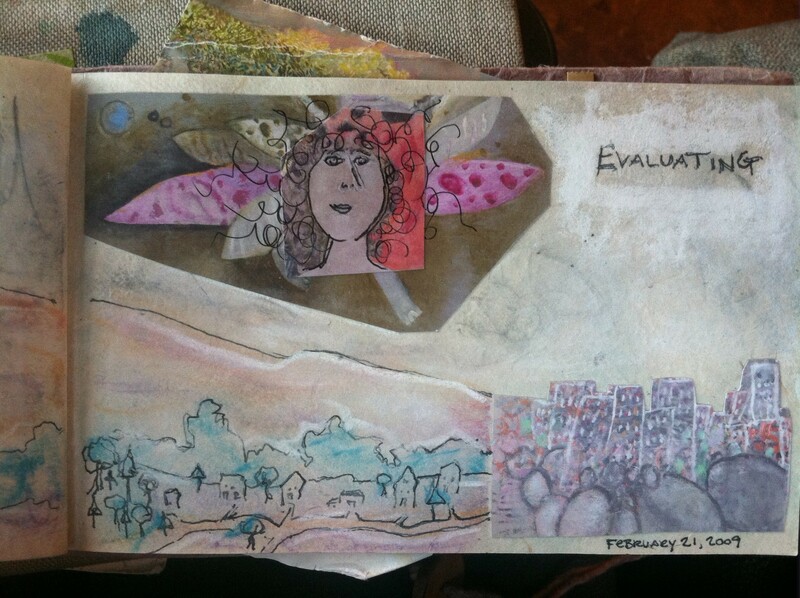 Since the LoveYourBrain camp I have been making art again at a level that I had never expected. Anytime I feel stuck, or lost, I just look at pictures of my mask and those of my friends at camp. I remember our stories and I am instantly filled with love. It is something I wish everyone could experience. It is what life really is about. I am so beyond grateful for camp and for the mask project that Carolyn facilitated. Without this experience I don’t know where I would be. It has inspired me to do art projects like this with the youth groups I volunteer with which has helped me to view my injury as a blessing. My injury has changed my life significantly in ways that are terribly hard but also in positive ways that I could never have imagined. My road to recovery is tough at times but I am doing it and now I have an amazing family in Vermont that I am so forever grateful and blessed to have. My brain injury has helped me better understand the true meaning of life and my mask is something I no longer need to wear. I just need to let my light shine through the cracks and let love flow. Thank you Carolyn for being such a light in this world for those of us that so desperately need it!! Let your art shine on!!! 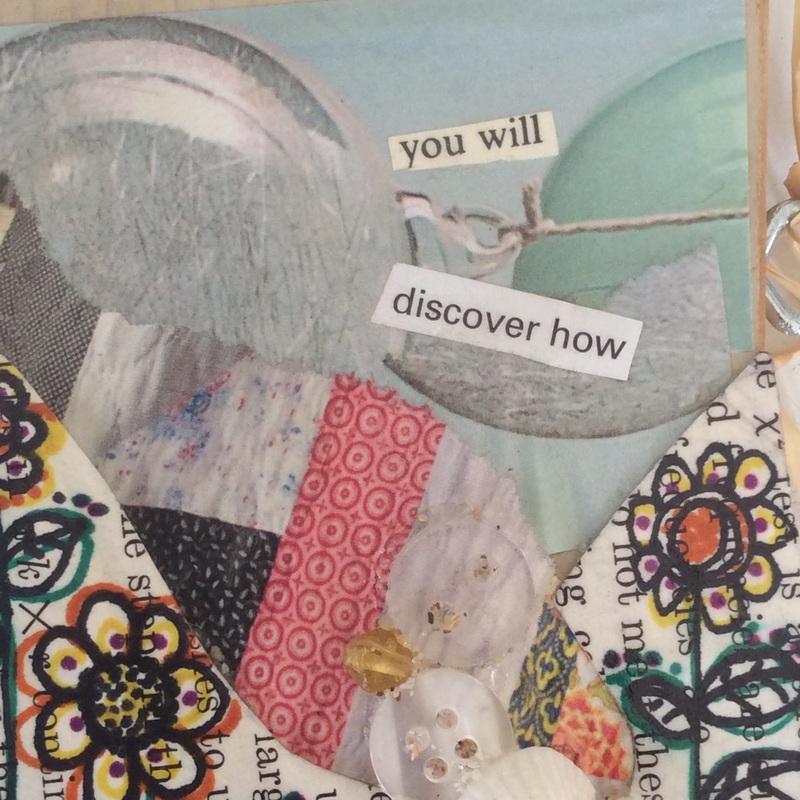 Ever wonder what it might be like to be an art therapist? Curious about how art therapy is used in a community? Recently a talented Champlain College student approached me about doing a mini documentary on my work as an Art Therapist in Burlington, Vermont. I was flattered and excited to see what might come of such a process as well as delighted to know that there was interest out there among young people in the field of Art Therapy. I love the work that I do and I am delighted to share it with you all! That said, if you’ve ever wondered what it might be like to be an art therapist, or how art therapy looks in practice within a community, take 10 minutes out of your day to check out this wonderful video! Much thanks to Gabi Blanco for her interest in my work, her creative vision and her professionalism and dedication in pulling together such an inspiring piece of film! Sometimes people ask me what it is that I do. Sometimes that question is also followed by another question: why do you do it? Recently these questions were asked of me by a colleague, Hannah Andersen, for a blog piece she was writing for an organization called ANEW Place. ANEW Place provides a holistic range of services from emergency shelter to counseling and career development for adults faced with homelessness here in Burlington, Vermont. I’ve been delighted to provide their residents with a weekly studio art class through my arts organization Whirled Tree Arts. So why community art therapy? Below I share with you Hannah’s post from earlier this month to help answer that question for you! Keep reading and if you have questions or would like to support our work, contact us or donate here! The connection between art and healing is one that has been seen throughout the world, during every time period. Art can be inspired by beauty, and fullness but it can also be used as a tool for recovery to those who have an untold story. It has the incredible ability to bring individuals and communities together. 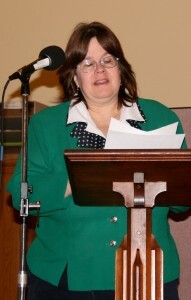 Art Therapist and licensed mental health counselor, Carolyn Crotty knows this all too well, and is helping to connect the members of our house with each other and with the community around them, through her community arts organization, Whirled Tree Arts. Carolyn has been very involved in ANEW Place by bringing art classes to ANEW Place for our guests, as well as holding the paint party fundraiser Create for a Cause to support ANEW Place. 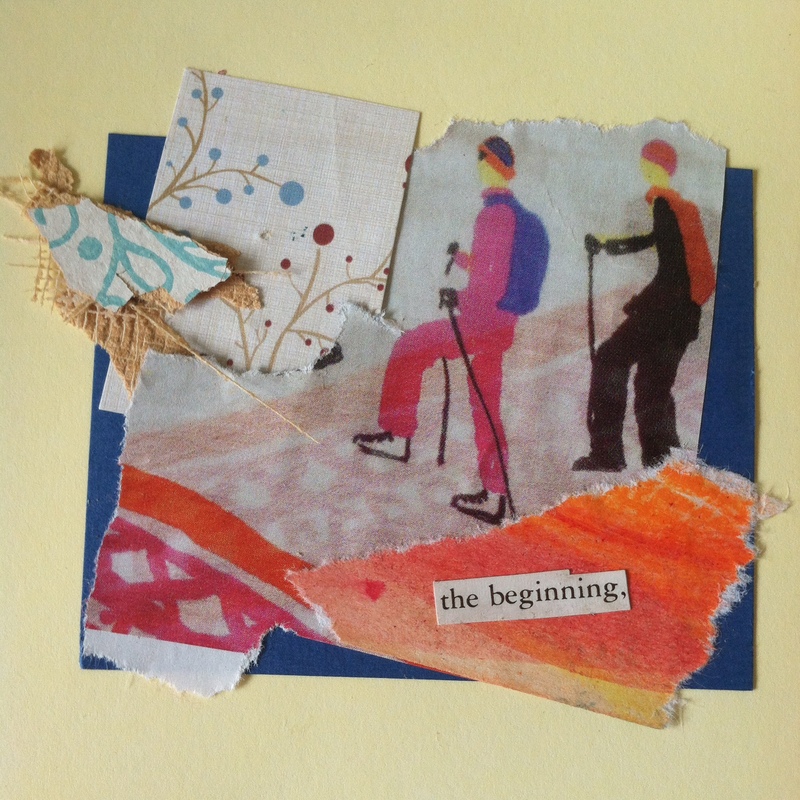 What are the goals of Whirled Tree Arts? I wanted to create an organization rooted in the idea that when we participate in shared creative experiences and engage in creative play and self expression our moods lift and our world expands. I truly believe there is magic in being both participant and witness to the creation of something from nothing (both artistically and metaphorically); this is both humbling and empowering. Whether it is through the painting of an elaborate portrait or a drawing of a simple line of crayon on a blank page, creativity enriches the soul. It cultivates compassion and unity and shines a light on humanity in a way that brings us all closer through color, shapes and lines. Art becomes a metaphor for life and our own process of growing into the people we wish to be in this world. We could choose to grow alone or we can choose to evolve together in a fun and creative, colorful way! In my experience as an artist, art therapist and teacher I’ve seen how art and creative expression help people connect to one another as well as to big ideas and concepts. The arts help us make meaning of our collective and individual experiences and provide us with a tool to reflect. My hope is that the workshops and groups I run through Whirled Tree Arts such as the Kitchen Table Arts open studio group at ANEW Place will serve as watering holes where people can come to find connection and meaning in their shared experiences while also paying respect to each individual’s unique life story. What are your favorite parts of the workshops you run? I love witnessing the parallels of the creative process and the process of how relationships form over the course of a workshop or group. There is always a “where do we start?” moment at the beginning and a sizing up of materials (and each other). It is an information gathering and assessment phase and then as people begin to arrange materials to create their artwork you can just see and feel the ease fill the room—people begin to open up to themselves and to each other and there is just this beautiful authenticity that people take on: their guards begin to drop and real connection emerges. It is just beautiful and it makes me smile every single time I witness and experience it. I find it even more miraculous in an age of social media and texting where our common interactions with one another in these ways have become so insubstantial and unfulfilling. The workshops I run give me hope that we as a collective community are still capable of being present with one another. This is the role I hope Whirled Tree Arts will play in the Burlington community and beyond. I want to create opportunities for people to be real and connect with one another authentically; to expand our collective awareness of each other’s experiences and stories and cultivate an honest shared empathy, understanding and respect for each other—for a small city and a small state, we have so many individuals living here with such inspiring stories! People who’ve overcome traumas and addiction, people who have survived abuse, people who have started their own businesses or worked on the family farm for decades, people who’ve survived poverty and others who have come from so many places around the world. Our region is so much more than green mountains. I wish to provide a way for those stories to be shared with no judgment just celebration of the rich fabric of our community through artistic expression. What are the challenges you face with Whirled Tree Arts and how do you overcome them? My organization relies on collaboration with other organizations and community spaces. We rely on partnerships for space and funding (we are a mobile art studio) but also for getting people in the room to make art. Relying on others can be hard because sometimes the needs of those other community spaces or organizations may not always align with the needs and goals of Whirled Tree Arts and sometimes it can feel like a competition for funds to keep all of our organizations afloat. It would be so easy to get frustrated by this or sit in a place of fear or disappointment but I’ve found the best way to manage is to meet other organizations and community partners where they are at. To honestly and openly strive to understand the needs, goals and challenges within the greater system of community providers and seek out a role in that system for Whirled Tree Arts to play that aligns with our greater mission and purpose. If organizations can mutually support one another then I think we set a tone in our community for individuals to do the same. This is the whole point in creating healthy communities: learning to work together by understanding eachother’s perspectives and seeking a way to make the world better together instead of separately. This takes patience and time and sometimes the most effective way to get from point A to point B is to go the long and hard way through. If I notice myself getting frustrated, disappointed or fearful that Whirled Tree Arts won’t bring in the funding or make the connections it needs to survive I just ask myself, “What’s the rush?” It all comes together in time if we just trust the process, follow the signs, be grateful and believe in the vision. The longer I operate in this frame of mind the more those connections and supports develop. I am overwhelmed with gratitude for the relationships that have formed in just less than a year ANEW Place, New Moon Café, BCA, ONE Arts, SEABA, COTS and so many more amazing organizations, businesses and foundations. It is humbling and reaffirms for me what I’ve always known to be true: authenticity paired with slow and intentional growth is the key to success. All good things come in time and I trust Whirled Tree Arts will grow strong roots in this community. It is already happening. As you take time to celebrate the season with friends and family it can be easy to get caught up in the chaos of presents and holiday parties. You may find yourself fighting off seasonal depression or feeling nostalgic or melancholy as the year comes to a close. Or you may relish in the joys of Christmas carols, lights on trees, hot cocoa and candy canes. For most of us this season can bring a mix of both sets of feelings. 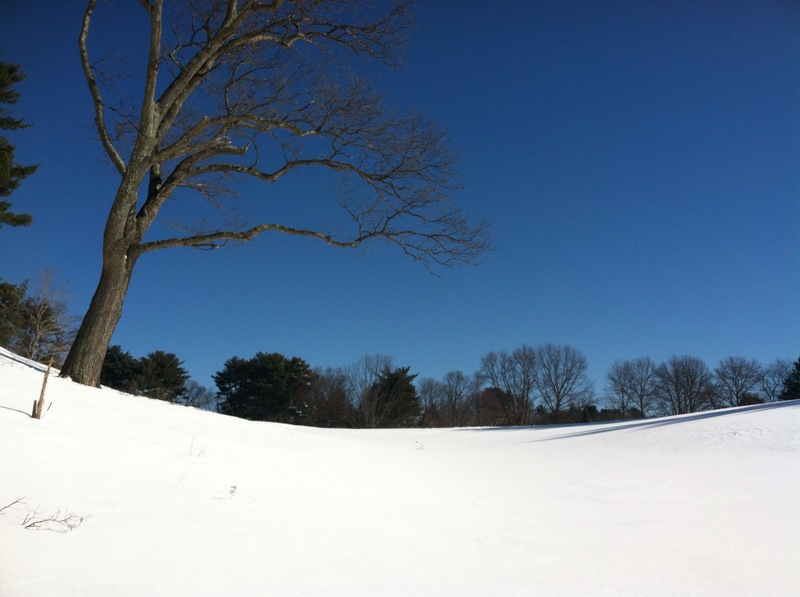 To stay grounded and healthy and not let the swirl of holiday mania get the best of us, here are 3 tips to beat winter blues and truly engage in the magic of this time of year. 1) Keep a gratitude journal…maintaining a mentality of gratitude is a fast way to feel the bounty and abundance we all possess. This can be important during a time of year when many of us are bombarded with advertisements aimed at convincing us that we need things. Combat the feelings of deficit and reflect on all that you have: people in your life you are grateful for, experiences you’ve had that you wouldn’t trade in for anything, moments that you cherish. Gratitude is magical and I am confident you will find that the more thanks you give, the more you receive. 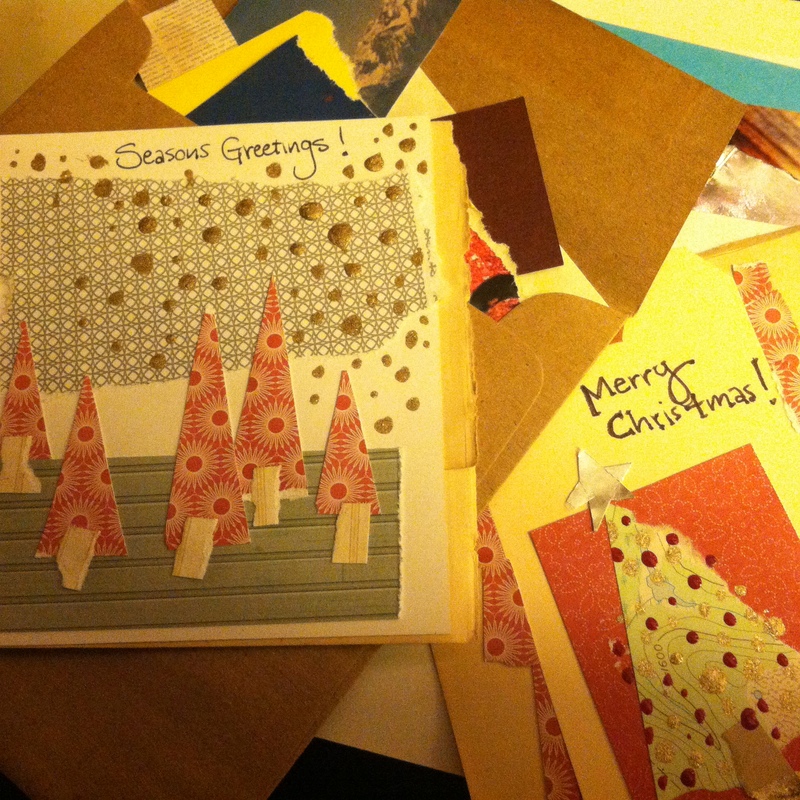 2) Make something for others…Giving homemade gifts can be daunting to some. The act of giving something to others that came from your own mind, heart and hands is a humbling and rewarding experience. It is like giving someone a piece of yourself and if you are not confident that a piece of you has value (or if you’re simply not confident in your handmade gift making skills) it can feel scary to offer these types of presents to others: What if they don’t like it? What if it’s ugly? What if they think it’s dumb? etc etc. The fears are real and it’s okay! However, the reality is, most people (especially the people who love you) will be so impressed, grateful and touched by the thoughtfulness, time and COURAGE that went into crafting their gift that your fears will melt away in the exchange and you’ll likely form an even closer bond with the people you’ve given your presents to. Handmade gifts can range from simple cards with thoughtful notes written on them, home baked goodies, a collection of recipe cards, or a whole host of simple DIY crafts from a scroll through Pinterest. Try encouraging others in your life to give only handmade gifts this year too! 3) Take a leisurely walk…too often we are rushing about in a frenzy this time of year. Quiet your mind and reconnect with your surroundings by taking a slow walk in the woods, your yard or even your neighborhood. Take time to notice…what sounds do you hear? do you notice any birds or animals? What is their behavior like this season? What do you see? Shapes, colors, people, nature? If you are in the woods, what signs of winter growth do you notice? Dormant buds on trees? Green moss or ferns encased in snow or ice? What does the air feel like on your skin? What smells are in the air…chestnuts roasting? Wood fire stoves? Pine trees? Or city smells? When we slow down we give ourselves the opportunity to experience our world in a new light. This creates space to see new perspectives and perhaps let go of the “I must do…” mentality and simply be in the joy of the moment. What are ways you stay grounded? Please share your tips and tricks as we all make our way through the season as thoughtfully as we can. Thanksgiving is my favorite holiday. It is just so simple: make good food, eat and share with loved ones, be grateful. Easy. 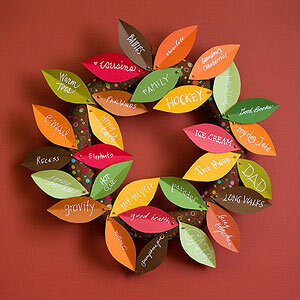 I love Thanksgiving so much I try to celebrate it every day, or at least the being grateful part. Giving thanks is a practice that I guarantee will boost your mood. I’m 100% sure there are studies on this but I hope I don’t need statistical graphs to prove to you that if you spend 5 minutes thinking about things that you are grateful for you will feel happier and lighter for at least the window of time during and after those 5 minutes. (If you want the graphs just let me know and I’ll dig up some research for you). Think about it though, if your brain is full of things that make you happy, wouldn’t you expect to feel happier? Even if it’s just for a little bit? Give it a try and let us know how it goes. 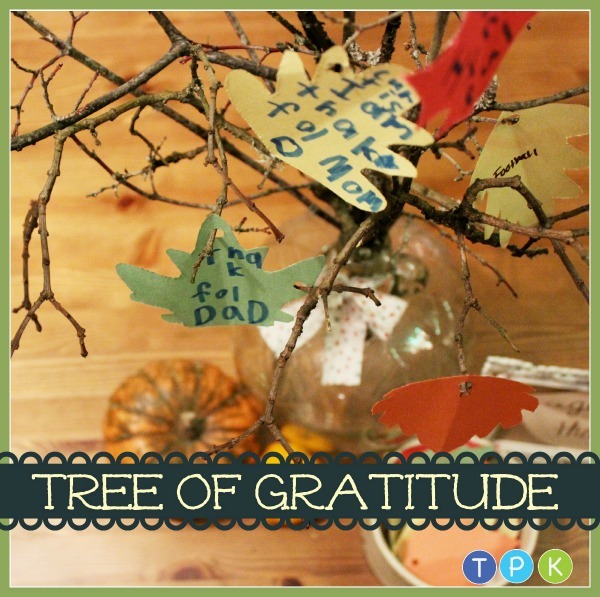 Below are 6 different ways to not only take a moment to give thanks but to do so with a crafty, artistic flare. Some activities are definitely better suited for little ones but many are accessible for all ages. 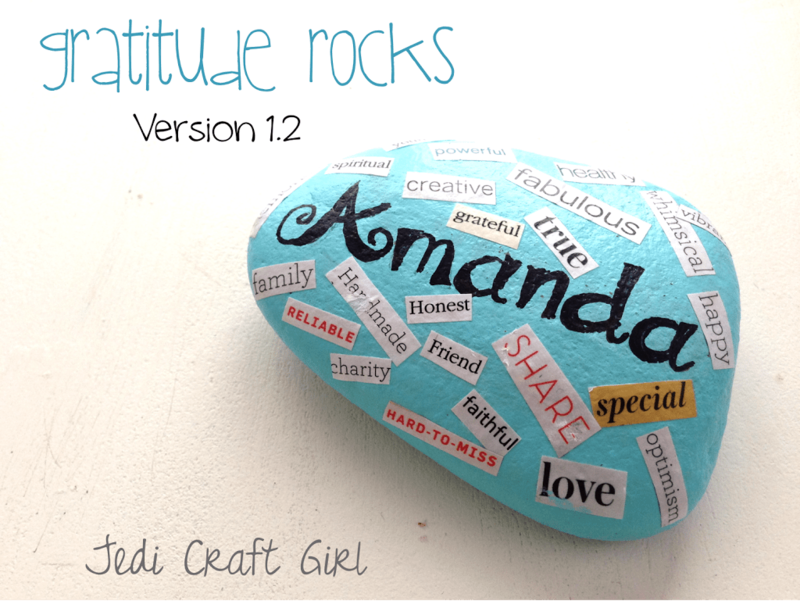 I think they’d all make great decorations to spruce up your home, classroom or office this holiday season or, if you’re like me, all year long because why should we limit gratitude to just one day? Click on the links for detailed how-to instructions from the original sources! 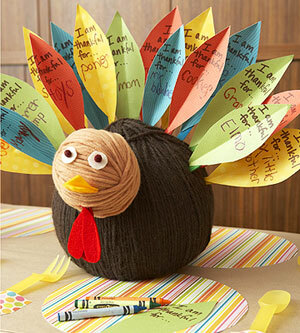 Happy crafting and happy Thanksgiving! November 15th-23rd is National Hunger and Homelessness Awareness week. Homelessness is an issue dear to my heart. It is a societal issue that is complicated and misunderstood which makes it difficult to address due to stigmas and community misconceptions as well as a lack of resources and misdirected funding. This is Najya and her daughter Sadai . They became homeless after Najya lost her job. High market rent drove the family to enter into Housing Families’ transitional shelter program. (photo courtesy of Housing Families, Inc. Learn more about Najya’s story here). This is Lori. She and her family became homeless after her husband lost his job and then shortly after was diagnosed with a chronic illness. Learn more about her story here. (Photo courtesy of COTS). This is Frank. He is an artist and a veteran. You can learn more about his story and purchase his artwork at ArtLifting. (photo courtesy of ArtLifting). The face of homelessness is the face of our neighbors. Here in Burlington, Vermont, 78 families, including 127 children, have stayed in emergency shelter so far this year (facts drawn from the COTS website). This doesn’t count the number of families who may be homeless but sleeping in vehicles, or staying at hotels or “couch surfing” at the homes of family and friends. A lot of people I talk to don’t think of homelessness as a problem that affects families or children. They often think of people who are homeless as being mentally ill or involved in criminal behavior. But as you can see from the faces and stories above, this isn’t the case. If there is one thing I wish for each of you to do in acknowledgement of National Hunger and Homelessness Awareness this week, it is to reconsider how you think of homelessness. If you have a home take a moment to share your gratitude. Consider what you could do to offer support to someone who may have lost theirs even if it is as simple as a genuine kind smile directed at someone on the street. If you do not have a home, remember your value. You matter. Your story matters. You are part of the community and people care about you. You are a courageous survivor. Have hope, persevere, connect, reach out–the bravest people are the ones who seek and receive help when they need it. ArtLifting.com—ArtLifting empowers homeless, disabled, and other disadvantaged individuals through the celebration and sale of their artwork. Housingfamilies.org—Housing Families, Inc., located in Malden, MA, works to end family homelessness and support families in maintaining permanent housing through providing safe, temporary shelter and affordable housing to homeless and at-risk families. COTS—The Committee on Temporary Shelter provides emergency shelter, services, and housing for people who are homeless or marginally housed in Vermont. ANEW Place—This is an organization based in Burlington, Vermont whose aim is to provide a holistic continuum of services for the homeless, centered in love and dignity, that foster growth, cultivate community engagement, and provide tools for lifelong change. Share your story! Do you know of an organization that is doing great work? Have you overcome hardship? What helped? Please share! I love hearing about inspiring people, places and things in communities near and far. We are all in this world together.